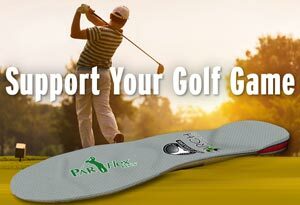 For golfers, Foot Levelers ParFlex Plus is clinically proven to help increase club head velocity and driving distance. Along with our 3 Arch Advantage™ support, ParFlex Plus uses magnets to help increase energy and stamina. ParFlex Plus is a great way to knock strokes off your score. Call to find a licensed provider near you — (800) 553-4860.